In the first such admission, Adm Samuel Locklear, commander of the NATO Joint Operations Command in Naples, said that efforts had been stepped up to target the Libyan leader, despite declarations by the Obama administration that “regime change” was not the goal. The admiral’s comments were revealed by Representative Mike Turner, an Ohio Republican and member of the House Armed Services Committee. 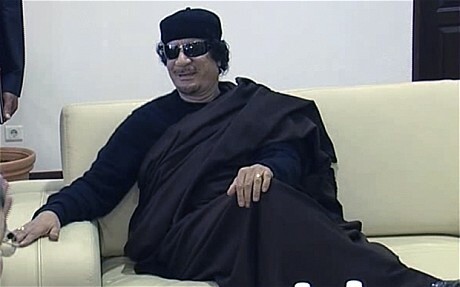 He told Foreign Policy magazine that he came away from his conversation with Adm Locklear convinced that Nato was acting beyond remit of the United Nations 1973 resolution on Libya, which allowed for enforcement of a no-fly zone and the defence of civilians and against Col Gaddafi’s forces. “I believe the scope that Nato is pursuing is beyond what is contemplated in civil protection, so they’re exceeding the mission,” he said. The admiral also repeated a comment he made last month that a “small force” might be needed on the ground in the initial stages after the fall of Col Gaddafi’s regime. Leaders of the African Union reiterated calls for a ceasefire to be observed by all sides, including Nato, and an interim government to be established following negotiations President Jacob Zuma of South Africa said signatories to the UN resolution had not intended “to authorise a campaign for regime change or political assassination”. “On the ground, there is a military stalemate which we cannot and must not allow to drag on and on, both because of its horrendous cost in civilian lives and the potential it has to destablise the entire sub-region,” he said.